How Important Is Thermal Insulation? When it comes to extending or building a new structure on the ground floor the type of soil in which we will be working with is important to identify. Various suburbs of Adelaide are known to have reactive soils locations such as Oakden, Lights View, Northgate and Aberfoyle Park. Our recent project was undertaken in Aberfoyle Park as you will see below. A client recently contacted us to investigate some ground movement along the side of there house. The area in question was located outside two of there bathrooms and it was covered by an over head shade sail. The first thing to do was lift the pavers and see what condition the soil is in below. Immediately upon removing a few pavers it was noted that the soil was all very wet, spongey and there were air pockets present. The next step was to keep excavating until dry soil could be found, unfortunately this did not happen, and the soil continued to get more saturated the deeper we went to nearly 1 metre in depth. It was at the depth of 1 metre the soil had become black and almost 100 percent saturated, it was like digging in a swamp! Why so much moisture this deep in the ground? As previously mentioned, Aberfoyle Park is known for having reactive soils meaning that they are likely to shrink and expand due to the nature of its makeup. When we encounter such conditions its crucial that various precautions are put in place to protect items such as the concrete slab, external fixtures and services running under and into the building. The concrete slab is likely to have more steel installed in it and have thicker areas to help it maintain its integrity when the soils shrink and expand. Services such as plumbing drains should have expansion and swivel joints installed to allow the drains to move without causing damage to the pipes. When the hole was further excavated, we found that the sewer drain was in this location and could well be responsible for what is allowing all this moisture into the hole. We followed the direction of the sewer drain to the underside of the perimeter footing where a small pond was found. Between the water membrane and the concrete slab was a huge amount of water just sitting there. 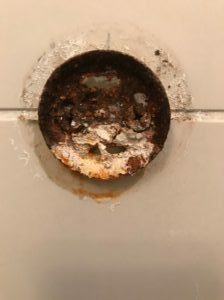 The main sewer pipe which ran from outside the home’s perimeter and through the middle of the house to pick up the kitchen and laundry sinks had snapped in half (as seen in image) this was the cause for so much moisture in this area. How to fix such a problem? In order to have this issue properly fixed we needed to now engage one of our plumbers to attend the site and asses the damage. The drain was further excavated to see what condition it was in down stream as the system was still holding a large amount of waste water. The drain was exposed another few meters where it was identified as having collapsed due to ground movement in this area also. 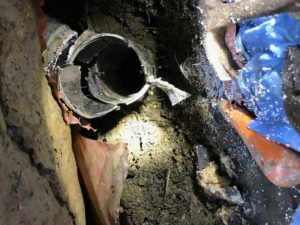 The lack of any type of flexible connections or expansion control devices certainly did not help, and the lack of quality fill being used provided a deadly combination which lead to this disaster. 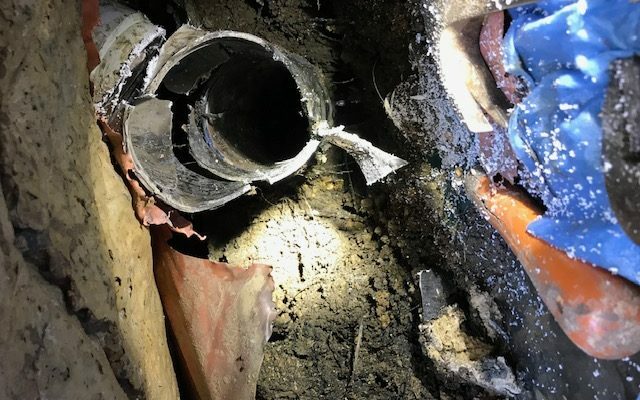 We would now need to identify a suitable point in which to join back onto the sewer system and then carefully re-install the drainage system with the correct swivel and expansion connections to prevent any future damage to the pipe system. Once the new sewer drain had been installed using the required swivel and expansion fittings and then tested it was time to have all the contaminated spoil removed from the site and new class A material imported to begin the backfilling process. Carefully the trench was backfilled and compacted in layers to ensure good support for the pipes and for the pavers which would be re-installed. Once all backfilling was completed it would be time for our paver to attend and cut the pavers to now allow for the new inspection openings for the drain to be raised to surface and install the pavers. Working with reactive soils is always a challenge and can cost more in the initial build stages BUT as you have just seen in this situation for the sake of a few hundred dollars’ worth of flexible connections and some good quality imported fill a situation such as this may have been avoided. When it comes to building there should never be any short cuts taken because the consequences can be disastrous. The NCC and Australian Standards have strict rules and methods of which must be adhered to when building or renovating a property, whether it be commercial, industrial or residential. These processes have been put in place to protect human lives and restrict damage to buildings during the event of a fire occurring. When we look at class 1 through to class 10a buildings we must ensure these buildings are either built at correct distances from one another, separated using the correct fire rating methods, provide adequate access during a fire or a combination of all rules. What are some examples of correct building practices to ensure fire safety? 900mm is the distance in which any class 1 building must be built as a minimum from a boundary that it is built on. If, however there is another building on the same allotment the distance is increased to 180mm between the two buildings. Class 1a buildings such as town houses, terrace houses and dwellings attached by a common wall must be have the wall which joins the two properties constructed of a fire rated material. Typical construction methods used to create this barrier are double bricked walls protecting each property from one another during a fire starting. Commercial buildings such as Class 5 and Class 6 may have penetrations going through the floor or dividing tenancy walls for systems such as air-conditioning, electrical and plumbing services. These must be sealed using approved products such as fire collars, fire rated mastic and fire rated pillows. All of these are designed to stop the spread of fire through the penetration as they close over the opening when in contact with fire. Cladding of structural members to ensure their integrity during a fire. If we look at multi storey construction the steel members which are used to hold up and tie in the building need protection from a fire for a certain period to enable the fire to be bought under control. In a situation where the steel column or beam may form part of an internal feature it will be cladded in fire rated gyprock so that it can still be painted and or decorated. If, however the structural member is concealed in a ceiling space or a plant room you might see it encased in vermiculite. 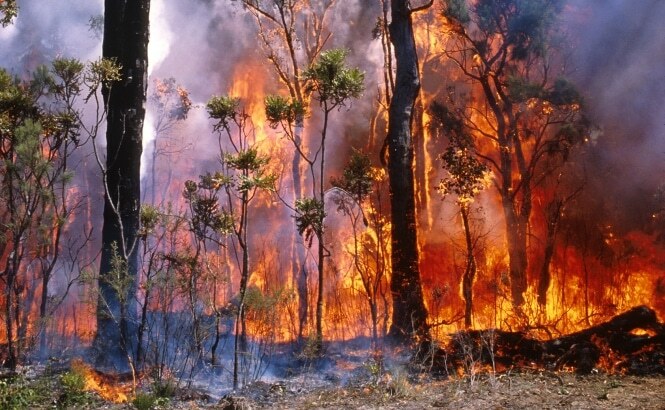 Protection from fire is one of the most vital components of any building project and adhering to the NCC and Australian Standards is something that cannot be cheated on. These rules and legislation have been put in place to protect human life and structures. When considering building in a bush fire zone you should always obtain the services of a qualified builder who can ensure that your project will adhere to the correct fire safety rules, your life might depend upon it one day. 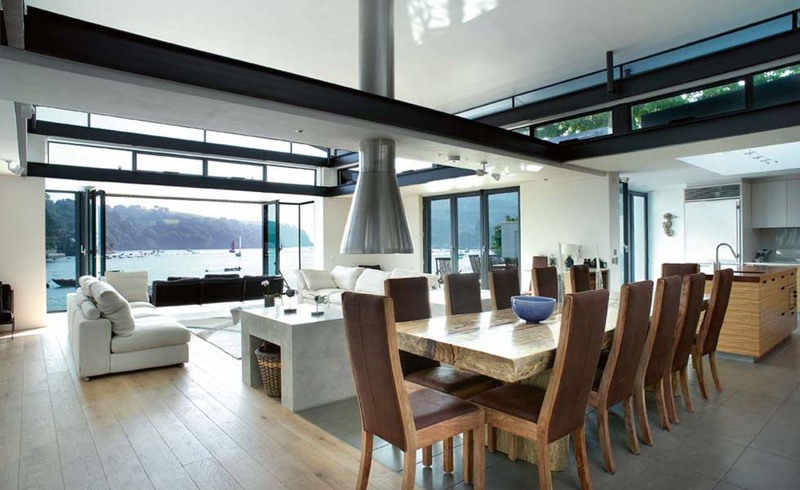 The growing trend we are finding today is to create a more open plan style of living. Of course, with any new build or extension we perform it’s easy as the plan and design is specified to create this feeling. 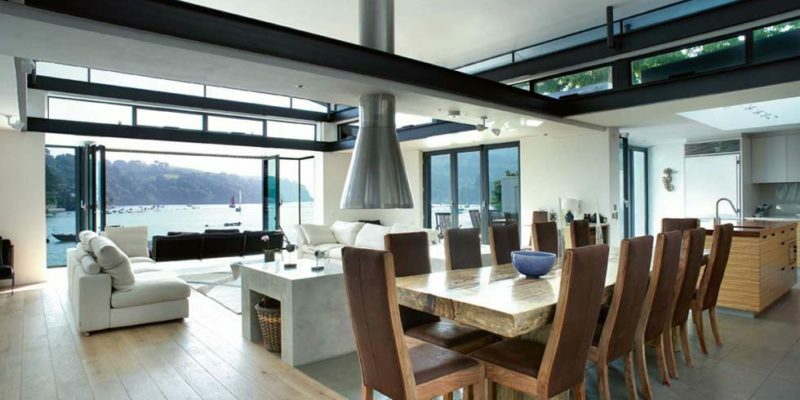 It is with existing properties which we renovate internally that the challenges can be a bit more demanding. The reason for this is that the initial concept was created to distribute loads from the roof onto walls and footings below (hence the term commonly thrown around “load bearing wall”), but where there is a will there is a way! Option 1: When a larger opening is desired such as removing an internal dividing wall an LVL beam is installed inside the ceiling space. The function of this large wooden beam is to pick up any load bearing members inside the roof space and have the existing loads then transferred through to other load bearing walls further apart. By doing this it then allows the wall below to then be removed as it is no longer serving their purpose of holding a weight from above. Option 2: Creating a door way or window opening is not as involved as removing a load bearing wall. When we are performing a task such as this an item called a lintel will be installed (in brick walls). A section of the mortar between the bricks above the opening will be removed either side of the opening and this piece of steel will then be inserted to hold the load of the remaining courses of bricks in place above the new opening. This method can be used for doors, entrance arches and window openings. Creating an open space certainly does give an overall feeling of togetherness it allows for families to all be together at once no matter if someone may in the kitchen, lounge room or dining room they all still see one another and communicate while enjoying life. If you are thinking of renovating and would like to create a more user-friendly space let us help you to understand just what can be achieved using the correct building practises, you might be surprised at just what can be achieved. If you are attending your local hardware store there is what would seem to be endless choices for the right screw for any project, and there’s a good reason. Screws can be subjected to varying weather conditions and this will have an impact on the type of screw you should be selecting. What screw for which purpose? Is the screw directly exposed to the environment or concealed? What type of conditions will the screws be exposed to? Will the screws be coated or left raw? Once we have established a few of these points its onto considering the types of materials screws are made from and what will suit your project. What materials are screws made from? Stainless Steel: Screws made from this material are going to the most expensive fixing you will purchase, and, in some cases, you may need to take a breath before shopping for these screws. Areas where exposure to high levels of corrosion is where these fixings should be installed. For example, buildings near coastal areas and projects where moisture levels are high will benefit from the corrosion resistant characteristics of this metal. Galvanized Coated: A coating applied to fixings (hot dipped galv) to assist in the prolonged life of the screw. This fixing is a dull grey in its appearance and are typically used in situations where the screw will no longer be accessed again once installed. For example, the installation of equipment inside of a wall or ceiling the void, you want the fixing to remain strong its entire life but cannot get to get again without ease. Zinc Plated: Probably the most common form of screw used in the building and renovation market today. These screws a gold/yellow colour in appearance, they are not so much of a heavy-duty screw but more a light weight fixing. For example, dry wall installers use these to assist in the installation of dry wall to either a steel or timber frame until the adhesive has gone off. You will also occasionally come across the screws being used in situations where they are not suitable. 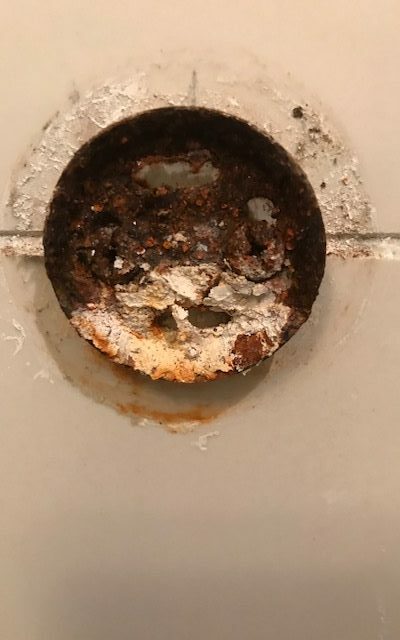 The image on this page shows where a home handy man has used zinc plated screws to secure a soap dish to the wall and due to this high exposure to moisture the fixings have rapidly deteriorated. Aluminium: Light weight yet extremely strong with high corrosion resistance and good performance in extreme temperatures. As equally expensive as stainless steel and only used where they are specifically required. For example, air crafts and motor vehicle which require a fixing that has a minimal impact on weight and can relied upon for its strength. Brass: A softer metal with a bright yellow colour. These screws are found quite a bit in the plumbing industry where the screw will be installed in a location where it will directly be touching copper and occasionally exposed to moisture, this material is both compatible with copper (won’t react in a negative way with it) and will also provide a good level of corrosion resistance. Certainly, one of the least used screws today in the building industry. Once you’ve decided the type of screw you will also need to establish how it will be installed. The three most common styles of heads you will find on a screw today are a flat (slotted) screw, posi drive which has a square inserted in the middle of the head and star shape also known as Phillips which has five points and looks like a star. Posi drive screws are used mostly where the screw is not to tampered with as you need a special shaped driver to insert and remove again. Today the most common head is the Phillips head and over 80% of the screws you will find in a hardware store or installed will have this style of head. It is something that can be over looked either during the design phase or construction process and even after many years of building being in operation the thermal protection may need maintenance. Today many designers and engineers are across the many available options on the market but like everything it comes down to price, BUT with the wrong product or no thermal protection the longer-term costs will almost be guaranteed to out way the initial costs back in the building process. What areas of a building does thermal insulation impact? Thermal insulation comes in many different forms and provides the same service to each area it is applied to. The design is to assist with lower energy bills through maintaining steady/constant temperatures to the material it is associated with. 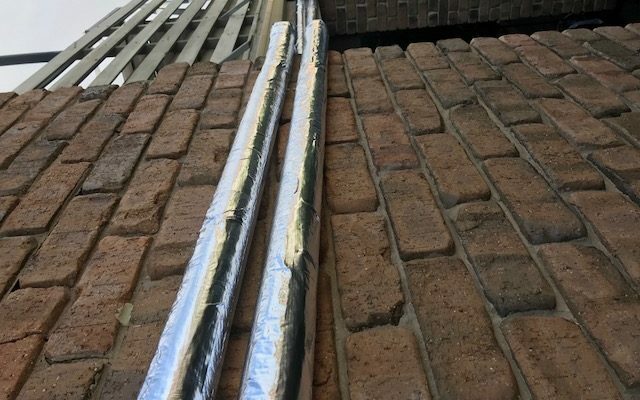 An example is the older properties we renovate in Adelaide such as Unley and Myrtle Bank have no insulation on the underside of the sheet iron allowing for a variety issues such as noise and excessive amounts of temperature differentials in the roof space to occur. We recently under took an energy audit of a block of 50 apartments in the suburb of Plympton in South Australia. There were various suggestions put forward to assist with energy conservation such as sensor activated lighting, roof ventilation to help hot air be expelled during summer, decrease draft entering under doorways, double glazing of glass, water saving shower heads, thicker curtains and solar electric panels on the roof for electricity. One of the main issues which has been immediately dealt with was the thermal protection to a large commercial scale water heating plant. Approximately 10 years ago a contractor was engaged to upgrade some of the infrastructure which provides huge amounts of hot water to the large volume of showers and baths at this facility. 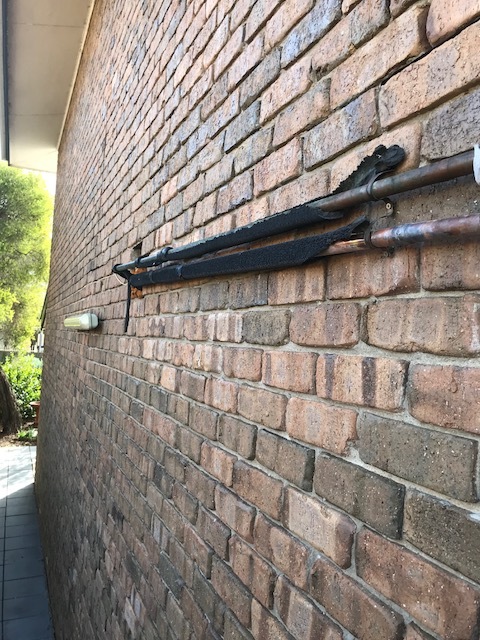 The installation was very poor and as you will see in the photos below majority of the pipe work which carries hot water into and around this apartment complex was missing or barely had any thermal protection. What this meant is that you have copper tube carrying 65 degrees of water exposed to elements allowing for a huge temperature drop. In turn the water heaters were working a lot harder then needed and the client’s energy bills were through the roof. A process such as the one described above was labour intensive, but even by the time we had completed only a third of the new pipe work insulation the increased temperature being kept inside of the pipes could be felt as we installed the insulation, the pipes were becoming warmer and even to a point towards the end of the process where they were hard to handle because the temperature of the water was being maintained to higher level. This entire process took a total of two full days and two staff members. With the continual rising of energy bills it has become increasingly harder for businesses to maintain the running costs while still trying to remain competitive in the market place. It is crucial that every part of the business is operating in an energy efficient manner. Sometimes businesses need to spend a bit of money to create a better environment in which they can start to save money. Today there are still state government incentives and rebates on offer for certain energy saving methods which not only gives the owner a money credit but the appliance being installed will immediately start to impact on the lowering of utility bills. If you are considering trying to decrease your utility bills contact us today and let us perform an energy audit on your property. When it comes to renovating (particularly on older properties 100 years plus in age) nothing is ever the same. Renovating older properties can certainly have its challenges particularly when we look at items such as doors, windows, ceilings, roofs and floors. Over time a property will move, expand and contract and things will become out of square and un even. During this process things such as doors and windows will become hard to open and shut and will therefore be planned and adjusted to suit the buildings current conditions. Other items mentioned such as roofs and ceilings will show signs of cracking and leaking. However, when we come to perform a renovation its no longer a matter of just purchasing new materials off the shelf from the local hardware supply stores. 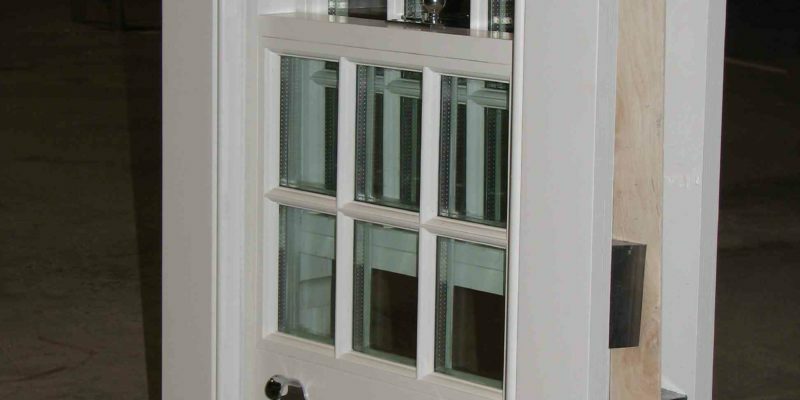 Items such as doors will need to be custom ordered or off the shelf items will require major modifications to suit its desired location and purpose. When we often look at restoring wooden floors the strains and sizes that were available some 100 years ago are surprisingly no longer available straight off the shelf today. Salvage yards are a good place to start looking for replacement pieces. If a strain of wood can be found such as oak the lengths may need to be cut to the correct width and planned to required thickness all these processes taking time and adding to the costs of a renovation of an older property. 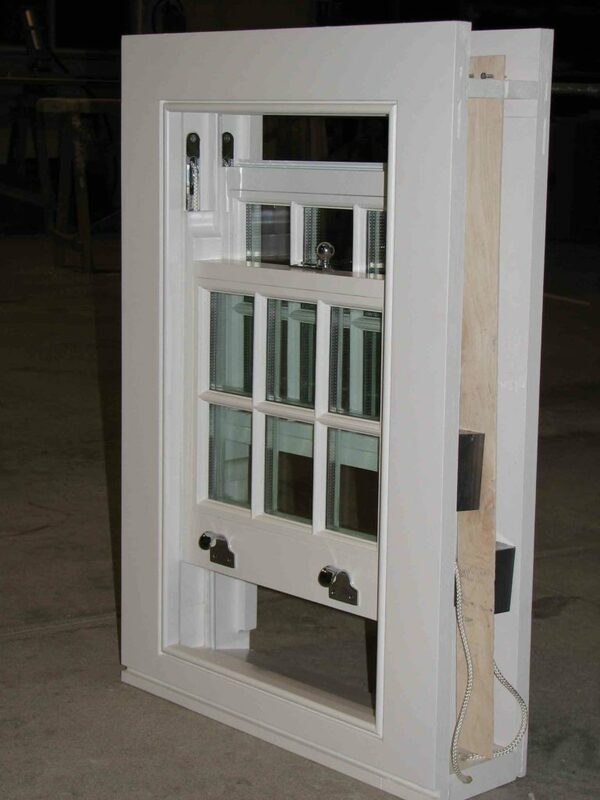 Many older styles homes had or still have windows which use lead weights inside the cavity attached to a rope and use a cantilever method to keep the window open. Over the life of the house unfortunately the rope deteriorates and leaves the window inoperable. These items can certainly be fixed but it is quite labour intensive. Firstly, the sides of the window frame must be carefully removed which will give us access to the cavity. Inside the weight used in the canter living process will be found (as seen in picture). Many of the older properties in South Australia which have not under gone a significant renovation will still have iron roofs as I touched on earlier in this post. These roofs are simply installed straight onto timber supports with zero insulation. Achieving a more energy efficient environment inside the property certainly becomes more of a challenge when we look at renovations on these buildings. There are internal insulation batts which rest on the gyprock or plater ceilings. This material can be replaced which is a great start. But if we are trying to achieve a reduction in noise and a further reduction in heat entering the roof cavity and warm air escaping the cavity a material called sisalation. 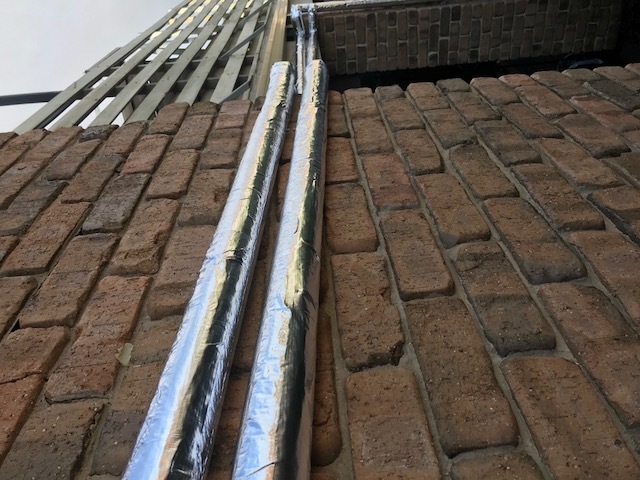 Sisalation is a foil blanket which is installed between the roof sheets and the timber battens, another barrier contributing to the maximise the energy properties of a home. When we look at renovating buildings no project is ever the same for the reason I have mentioned above. Nothing is ever the same and experience of knowing how to get around the challenges of each project is what has made the Mayfair Building Group a leader in renovations of all shapes and sizes. When it comes to getting the perfect result from any type of renovation the time spent earlier in the project on extra preparation will reward you at the end with an AMAZING outcome. down and allow moisture behind the tile itself. Providing the water proofing has been done by a qualified contractor it will prevent this moisture from damaging the linings of the walls and potentially entering a neighbouring persons property through the floor in apartment style living. What Areas Should You Consider? Areas such as the shower which are constantly wet when is use get water proofed on the floor and on the walls to the full height of the tiles. 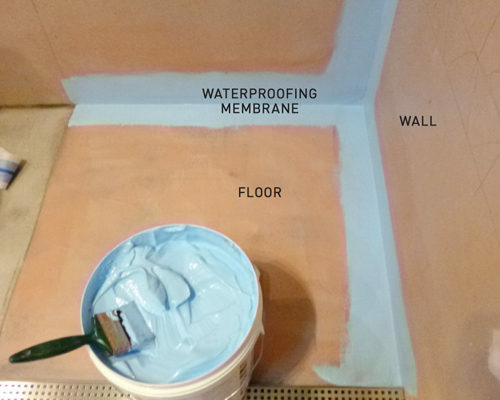 The water proofing membrane is installed before any tiling is performed and before any painting can be done. Inside a bathroom the entire floor also gets water proofed as this is wet most of the time a bathroom is in use and even for a short period after the room has been in use until the floor dries out. When we perform a renovation such as a bathroom make over water proofing is an area which our tilers pay close attention to. We only use the best products available on today’s market with longest warranty periods giving our clients the peace of mind they deserve. 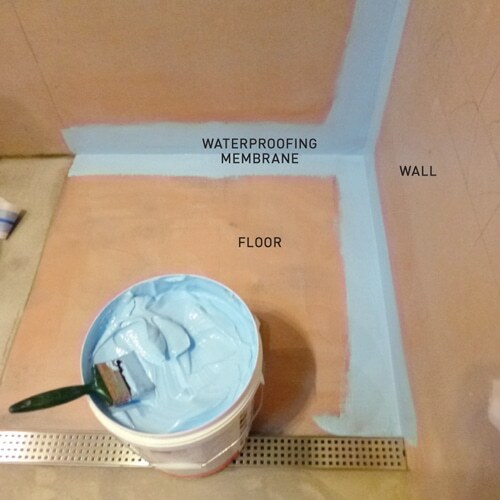 Water proofing is something that you don’t see when a project is finished but if it is not done properly the results later in life when a bathroom has been in use for many years can be catastrophic. The results from not water proofing properly or at all can lead to the entire wet area needing to be re done and a project like that can cost well into the thousands of dollars not to mention the disruption to your bathroom and home, therefore we always recommend using a qualified company such as the Mayfair Group. When it comes to water proofing you only get one chance to do the job right so by taking the time necessary to get the job done correctly is certainly worth the effort.